When President Trump, at an event honoring the contributions of Native Americans during the World Wars, took the opportunity to slam frequent critic Sen. Elizabeth Warren by referring to her as "Pocahontas," he raised the ire of Native Americans. The president had said to the World War II veterans, "You're very, very special people. You were here long before any of us were here. Although we have a representative in Congress who they say was here a long time ago. They call her Pocahontas. But you know what? I like you. Because you are special." Mr. Trump has called her "Pocahontas" in the past in reference to questions about Warren's claim of Native American heritage. The controversy stems from a flap that originated with her Senate campaign, in which she was unable to prove definitively that she had Native American blood. The National Congress of American Indians (NCAI) was quick to condemn Mr. Trump for using a slur against Warren that overshadowed the intent of the ceremony. "We regret that the President's use of the name Pocahontas as a slur to insult a political adversary is overshadowing the true purpose of today's White House ceremony," stated NCAI President Jefferson Keel, a decorated U.S. Army officer and Vietnam War combat veteran. "Today was about recognizing the remarkable courage and invaluable contributions of our Native code talkers. 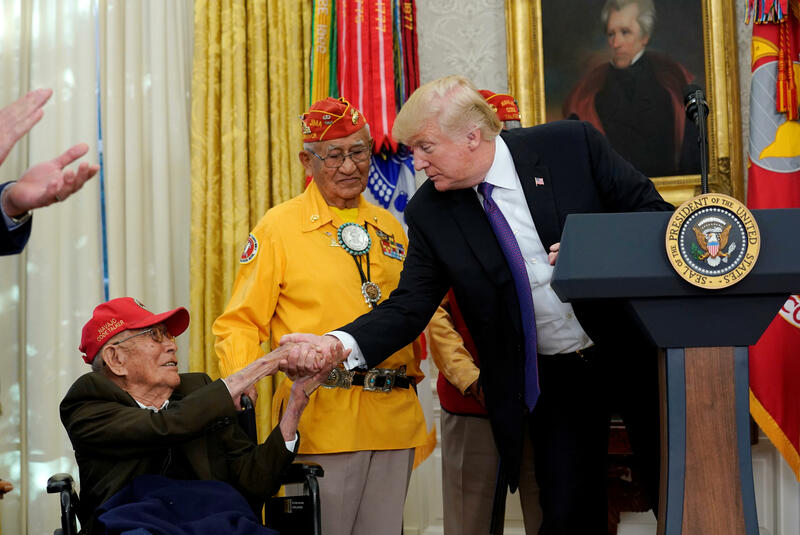 That's who we honor today and everyday -- the three code talkers present at the White House representing the 10 other elderly living code talkers who were unable to join them, and the hundreds of other code talkers from the Cherokee, Choctaw, Comanche, Lakota, Meskwaki, Mohawk, Navajo, Tlingit, and other tribes who served during World Wars I and II." NCAI referred to a release issued at another time when Mr. Trump used "Pocahontas" as an epithet against Warren. In that statement, the group pointed out that Pocahontas and her family, part of the Pamunkey Indian tribe in Virginia, played a valued role in American history, having signed a treaty with the British in the 17th century. They were only recently officially recognized as a tribe by the U.S. government, though. "The name of Pocahontas should not be used as a slur, and it is inappropriate for anyone to use her name in a disparaging manner," the group said in May. Mr. Trump has often mocked the Massachusetts senator with the nickname during the presidential campaign, and even after. The Navajo Nation, too, weighed in, saying that it "does not want to engage in this dialogue between" Warren and Mr. Trump, but the group's president, Russell Begaye, complained that "in this day and age, all tribal nations still battle insensitive references to our people.The prejudice that Native American people face is an unfortunate historical legacy."